KB414: BDL168 - Physical size of the board? What is the physical size of the BDL168? The board itself approximately measures 3 3/4" wide by 3 5/8" long by 1 1/4" high. For those who use metric, it is 94mm by 92mm by 30mm. 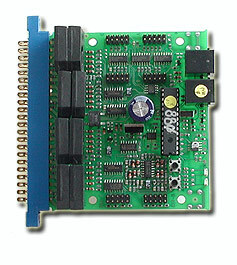 In addition to the board itself, the edge connector measures 4 1/32" (112mm) by 3/8" (10mm); it has edge connector pins which make the connector 5/8" wide (18mm). The edge connector pins will need additional clearance for the connected wires. Users have found that the heavier bus wires used in most applications are difficult to connect to the edge pin connector; in ths situation, they solder short lengths of smaller wire as "pig-tails" to the edge pin connector and then connect the heavier wires to the pig-tails, using shrink wrap tubing to prevent electrical shorts. The BDL168 has four mounting holes which can be used with screws and standoffs for mounting.